I'm a visual artist and filmmaker. I'm trained as an artist at Minerva Acadamie in Groningen and CCAC in San Francisco. I was awarded with the Dooyewaard stipend and a year’s stay in the Blaricum Artist in Residency programme. In 2008 I obtained my Master of Fine Arts at The Dutch Art Institute and I'm trained as an art teacher at the HKU in Utrecht. As a filmmaker, I directed the acclaimed documentary Make Jewish babies? This was broadcast a number of times on Dutch national TV by NPO and screened at numerous European film festivals. As an artist I'm fascinated by the concept of space; the natural space, the artificial space, the city, architecture and living spaces. Through the means of painting, drawing and video, I explore spaces in transformation and how individuals interact with their surroundings and with each other. Time is an important thing in this. As well in this painting. People have been there. Cross each other without meeting. Here you can find the (Dutch) article Begrenzing en vrijheid in de schilderijen, tekeningen en films van Daniëlle Davidson. By Nicole Hermans, art historian and Journalist, 2016 You can see the space in different perspective. DANIËLLE DAVIDSON (1981) is a visual artist and filmmaker. She trained as an artist at Minerva Acadamie in Groningen and CCAC in San Francisco. 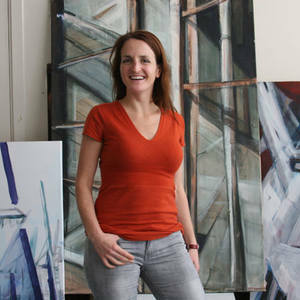 She was awarded with the Dooyewaard stipend and a year’s stay in the Blaricum Artist in Residency programme. She obtained her Master of Fine Arts at The Dutch Art Institute and trained as an art teacher at the HKU in Utrecht. 2012 Film Make Jewish Babies?’ shown at FESTROIA film festival in Setubal, Portugal and the Aspecty festival in Poland. 2010 Organisation and participation in project “The Sound of Shadow” and Gashouder Ketelhuis. Istallatie with 16 silent films were projected. 2009 Green Fingers, Exhibition at the Amstel, Place Foundation in collaboration with Amsterdam Fund for the Arts. 2008 Minerva 10 years and Dooyenwaard Stipend, Studio 2000, Blaricum and Academy Minerva, Groningen, publication. 2007 Arthouse SYB, Beetsterzwaag, 1 month recidency. 2006 Recidence ArtLink 1 month, Intervention in Majdanpek (Serbia), exhibition and publication. 2006 Czech Republic, Olomouc work period of 2 weeks after the work is exhibited in Olomouc, Prague in the parliament building in Brno. Collaboration, Gallery G, the project was called “pro cloveka Misto”. 2015 Commissioned painting and stop motion for Willemsparkschool The Hague. 2015, Publication project NI-C-OS in Urban magazine, Art and Architecture, Georgia, New Image – Constellation of Space. 2006 Recidence Artlink 1 maand, Intervention in Majdanpek (Servië), 1 month working period, exhibiotion and publication. 2006 Tsjechië, workperiod of 2 weeks, in cooperation with gallery K, after that the work was shown in Olomouc, Praque in the parlement building and in BrnoThe project was named, “Misto pro cloveka”. Including publication. April 2005, nr 28409-09-04, Gelderlander , Expositie, Daniëlle Davidson. Kunstplaats, een plek voor een mensen die er niet is.